MHT Partners grew out of a political campaign. L to R: Wade Hansen '95, Mike McGill '95 and Shawn Terry '94. Never go into business with friends or family, runs the conventional wisdom. For many people thinking about working with someone from their social circle, thats probably still good advice. Great friends dont necessarily make great business partners. A friend might not be skilled or driven enough to succeed in a job. Moreover, the personality quirks that add flavor to a friendship can prove toxic to a business partnership  not to mention the friendship, if the working relationship heads south. But some alums have found ideal business partners among their Kellogg School comrades. Heres how a few of them are negotiating the pitfalls and reaping the rewards of building a business enterprise with a friend. When Dallas resident Shawn Terry 94 asked his friend Wade Hansen 95 to serve as campaign treasurer during his race for Congress in 1998, Hansen initially hesitated. Hansen soon found himself handing out campaign literature and setting up yard signs, as well as overseeing Terrys election finances. Terry lost the election, but the pair emerged with something perhaps even more valuable: the groundwork for a successful business partnership. 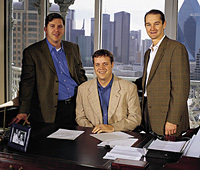 Hansen, a founding principal of Dell Computers venture capital arm, persuaded Terry, who was working for a private equity firm, to partner with him and create a boutique investment bank for middle-market businesses. Mike McGill 95, an investment banker whom the pair had met through the Kellogg School network, joined the business less than a year later. The result: MHT Partners, which opened for business in mid-2000. The firm offers a wide variety of investment and strategic advisory services to firms with enterprise values between $10 million and $200 million. Hansen and Terry say their personalities are complementary yet compatible. Wade tends to drive harder and more quickly to a conclusion. Im probably a little more cautious and like to search for alternative solutions, Terry says. But those differences seem to work in their favor. The two do see eye-to-eye on the larger issues surrounding their business  their management philosophy, ethics and their approach to serving clients. They also share a strong commitment to the friendship that preceded their partnership. Obviously, Wade and I go in different directions on a lot of things. Anyone in business together disagrees with their partner at times, says Terry.